Sandy Menden: Feel better sweet boy. Amanda Stenson: Feel better soon!! Badger and Bella (Former BREW beagle). Anonymous donation. Rose Anne Everson: Sending love and hugs to Napoleon as well. 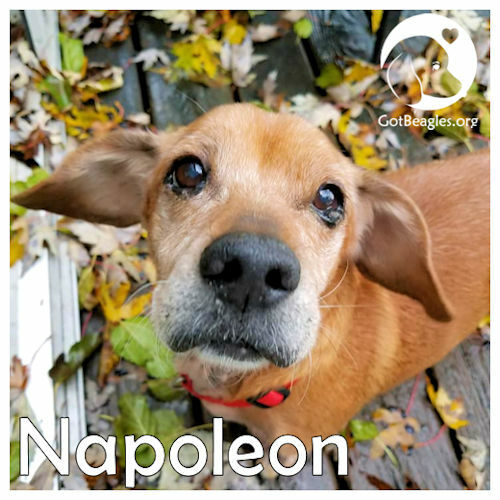 Anonymous donor: I hope you feel better soon and heal quickly, sweet Napoleon. Mark Currier: Hope this helps with the bee stings. Hang in there Napoleon, you're in great hands with the folks at Midwest BREW! Get well soon! Susan Wenner: Heal quickly sweet Napoleon. Glenda Olszowy: Napoleon, you landed in the arms of angels..you'll be better soon! Antonella Scarpiello. Joan Gerage: Feel better soon, sweet guy. Anonymous donation: We hope we can help you get better soon! Claire Murphy: Hope you get better soon, Napoleon! Barbara Klaczak. Meet Napoleon, although we call him Neo for short. It just fits him better. This cute little old man came to foster after his owner passed away. He had some pretty significant skin issues that have been addressed as you can see by his photos. Neo had a lot of food and environmental sensitivities that cause a constant overgrowth of yeast. Because of these issues, he will need to have someone that can watch his diet carefully to maintain a balance. We haven’t conquered all the issues and he still has flare-ups and gets itchy every day, but he is living a much better life now than he was before. 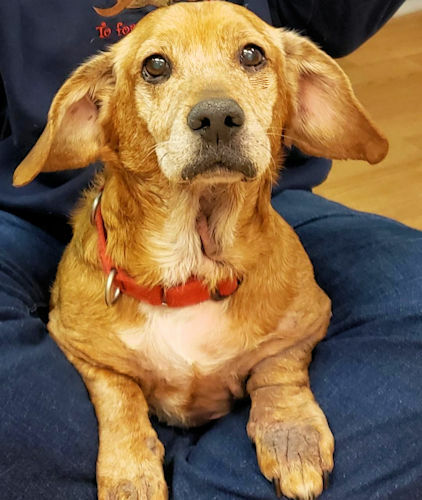 Neo is 10 years old and a mix of beagle and dachshund and maybe something else. His little legs are short and wrinkly and his back is long. Due to the length of his back and maybe a former injury, he has some backend weakness. He isn’t in pain, but tends to be a little wobbly and falls down a bit. This doesn’t stop him from moving and being happy. Neo has a super gentle personality and he rarely barks. He is content to sleep next to you or in a comfy bed. Neo longs for petting and will nudge you to tell you that he wasn’t done enjoying the attention. He is good being left alone, but he might get lonely if you work long hours as he has been used to someone around most of the time during his life. Neo isn’t a fan of being outside by himself and prefers to potty in the front yard on a leash instead of the entire fenced backyard where he can run free. Neo is just and overall sweet little man and deserves a quiet place for him to spend the rest of his life being the special dog. If you are interested in Neo, please fill out an application today. NOTE: Dog may be located in any of our six volunteer states (WI, IL, IN, OH, PA, MI).